ZYPPAH, the only solution with Z-Factor™, our patented Tongue Elastic, that ends your snoring by addressing the root cause, your tongue. Plus, every ZYPPAH is backed by our 90-Day Money Back Guarantee. Before being diagnosed, I didn’t realize how serious the effects of my snoring could be. Not only did it scare me, but my snoring was causing those around me to suffer. I met with Dr. Greenburg multiple times to find a solution and he introduced me to my ZYPPAH snoring device. It works for me and now I want to help others. Stop Snoring with ZYPPAH or your Money Back! ZYPPAH, which is Happy Z spelled backwards, is the only solution that comes with Z-Factor™, our patented Tongue Elastic, that ends your snoring. Plus, every ZYPPAH is backed by our 90-Day Money Back Guarantee. Stop the root cause of snoring by going directly after the tongue. 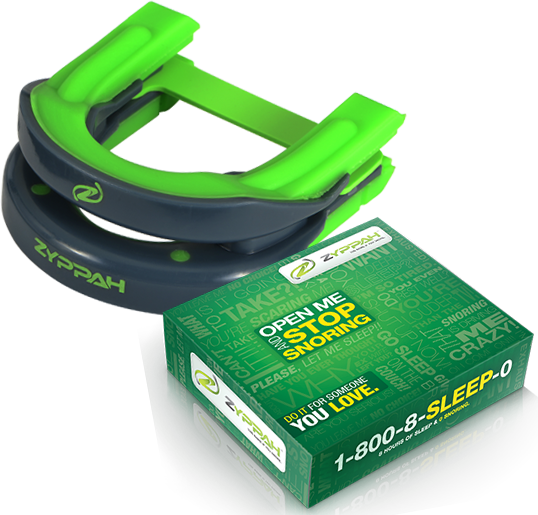 ZYPPAH is the only snoring solution with a tongue strap. It's like a seatbelt for your tongue. It prevents the tongue from blocking your airway. Our revolutionary tongue elastic is your key to ultimate success. Every ZYPPAH is Guaranteed. If you are not completely satisfied, return it within 90 days for a full refund. Read all instructions before use. Use only as directed. © 2018 ZYPPAH. All Rights Reserved. ZYPPAH® is available through this website, our telephone order lines and Sleep Certified® dentists and physicians.